Currently I'm on a Culinary Quest with friends, which led me to the South of the USA. 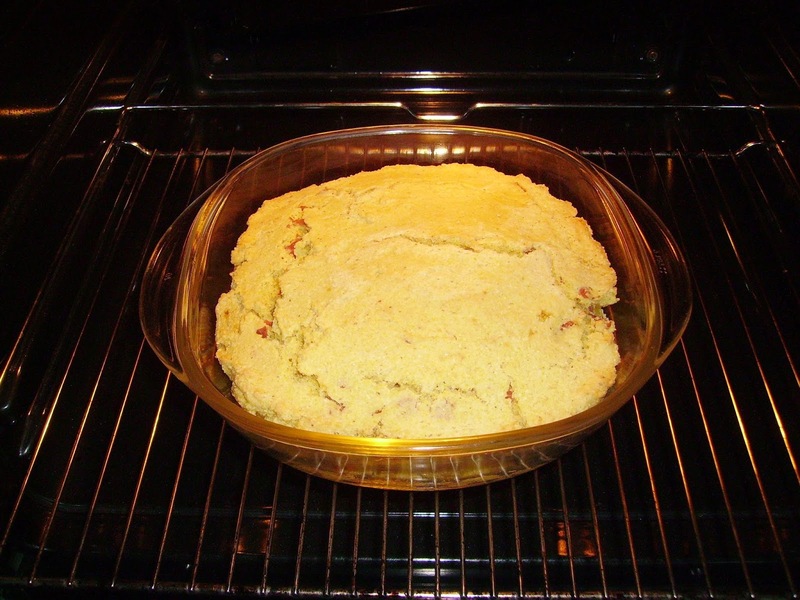 Being half Romanian, one of my favourite comfort foods is mamaliga, the Romanian version of polenta. 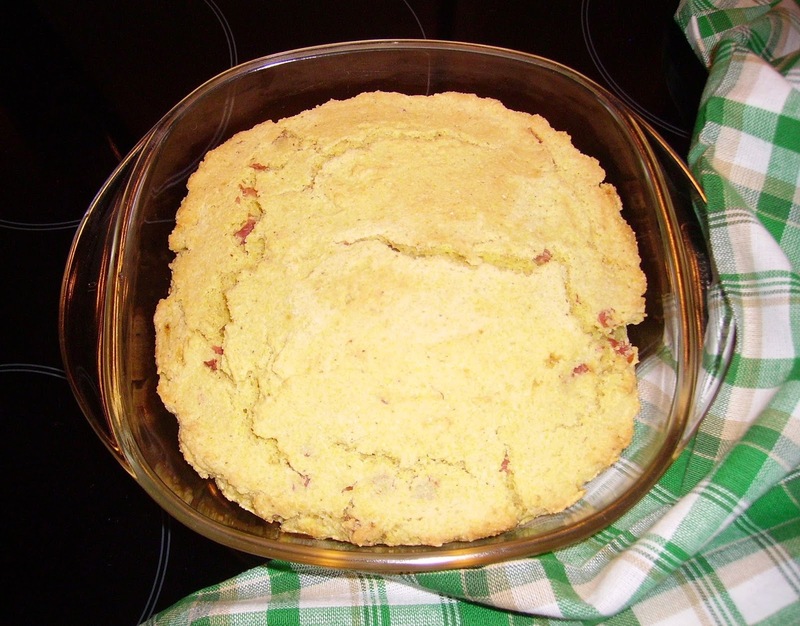 Accordingly, I was utterly pleased when my first US cookbook 14 years ago introduced me to Southern cornbread. I hunted down blue cornmeal, which is not exactly easy in Germany, and purple cornmeal, which isn't easy either. What is easy to find here is fine yellow corn flour. Fine as in really fine, like rice flour - NOT cornstarch!! Fine yellow stuff which is a staple in gluten free baking in Germany. Of course it has this distinct con flavour which is not always desirable, but I like it, and I like to use yellow corn flour in cookies and cake. 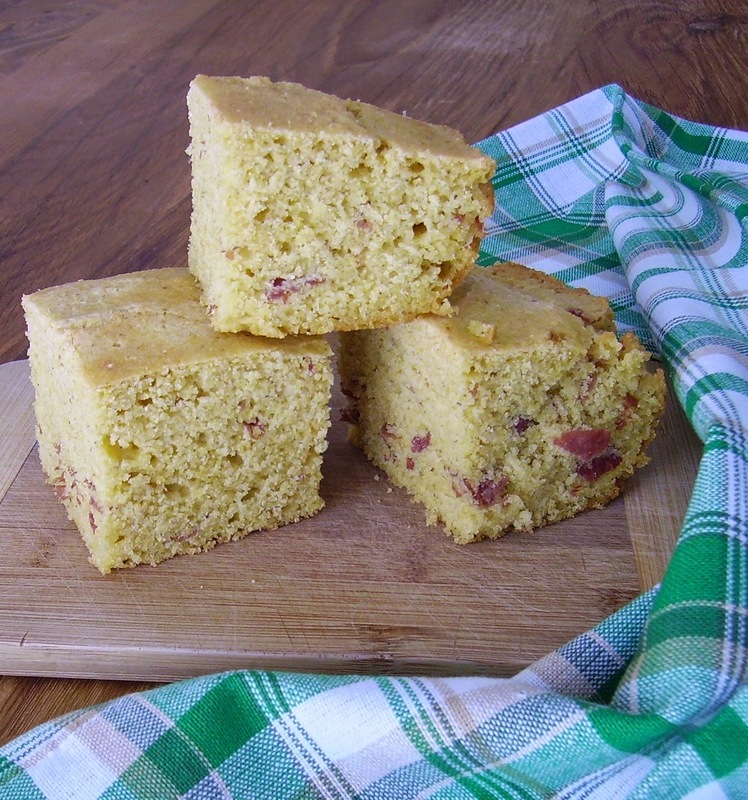 Not long ago, my dear friend Paula posted a recipe for corn flour corn muffins which I eagerly made and thoroughly enjoyed. 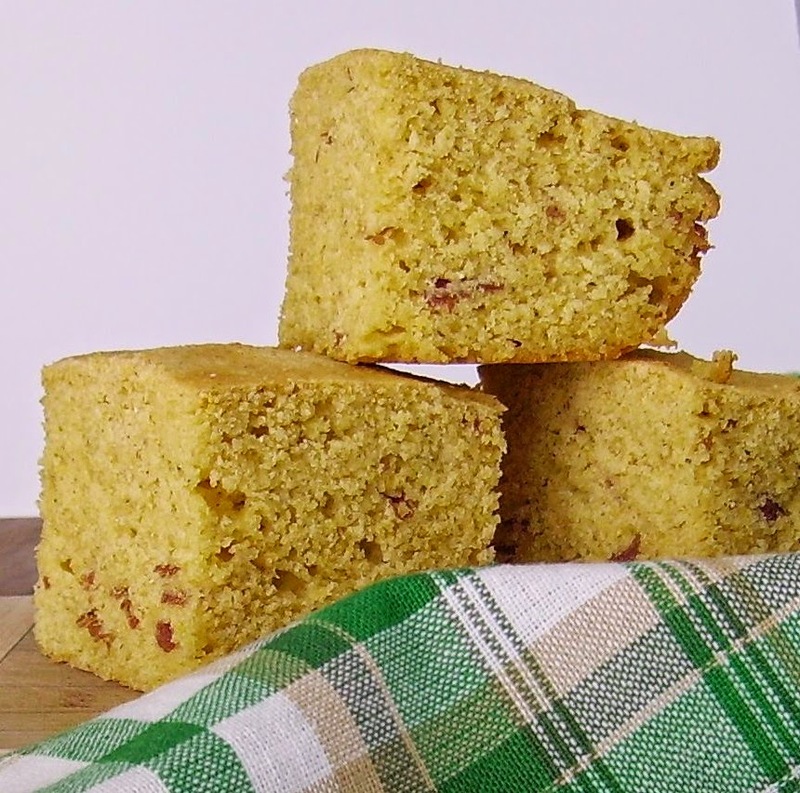 Now I have taken the challenge of our Culinary Quest to develop my own cornbread recipe, and I decided for a cornbread using yellow corn flour. 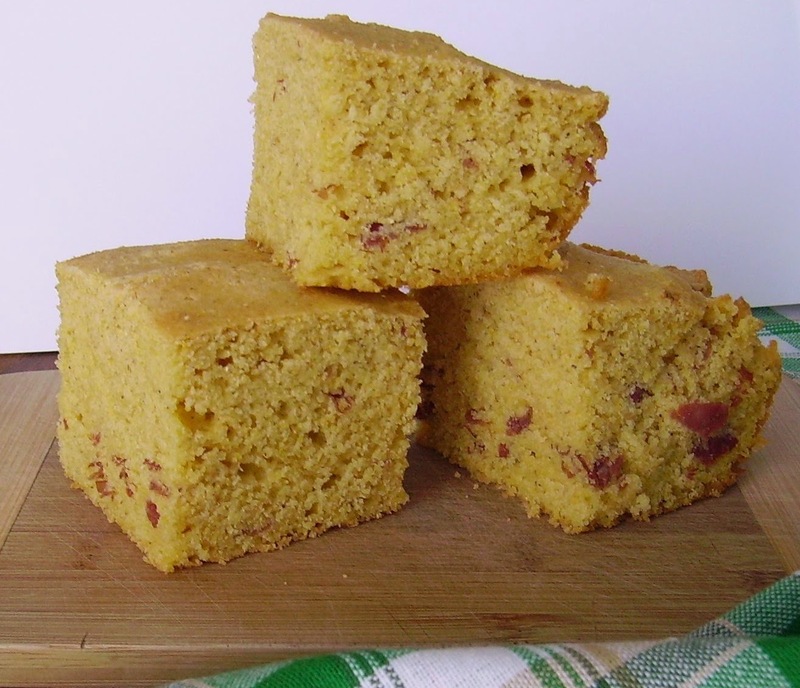 As I'm not fond of the really sweet versions of cornbread I decided for a version using only a little bit of brown sugar to contrast the bacon, which I intended to put into it, too. I used turkey bacon, but you can use any kind of bacon including vegan bacon. Vegan coconut bacon is the most awesome alternative, which would be great in this bread. You can also use any kind of yoghurt - regular, sheep, goat, soy, coconut. If you don't want to use it, replace the 1 cup of milk and 1/4 cup of yoghurt with 1 1/4 cups milk of any kind, which you sour with 1 tablespoon vinegar. Fry the bacon until crisp; if using turkey or vegan bacon, fry in some coconut oil, regular bacon doesn't need any oil at all. If using coconut bacon, there's no need to fry it. Just grab a handful and throw into the prepared batter. Preheat oven to 375 °F or 190°C. Place the coconut oil in an 8x8 inch square baking pan and heat on medium heat, until the oil is liquid and fairly hot; remove from heat. In a bowl, combine cornmeal, corn flour, cornstarch, brown rice flour, xanthan gum, salt, sugar and baking powder. Mix egg, milk and yoghurt, whisk until smooth. Pour liquid mixture into dry ingredients, stirring, until the batter is smooth. Add in the fried bacon and the bacon grease, or just the coconut bacon, stir well to combine. Pour batter into pan with the melted coconut oil, smooth top. This is awesome when served warm, but I also liked it after cooling. Enjoy with salad or soup or topped with peanut butter! That is some lovely cornbread. I will need to give it a try. I made this to go with lunch today. Instead of baking in a square pan I opted to use my 8" cast iron skillet. The bacon was cut into pieces and cooked until crisp in a heavy skillet. The bacon and fat were used to make the bread. Since I was using the bacon fat I left off the coconut oil The bread has a nice texture. Hubby and I both enjoyed it. Thanks so much for trying and commenting :) I'm glad you enjoyed it!